BEng (Tehran Polytechnic), Certificate and M.Sc. 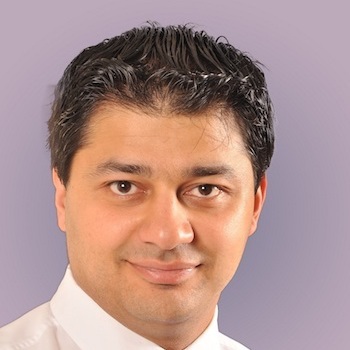 (University of Lethbridge), Ph.D. (John Molson School of Business, Concordia University) Ebrahim Mazaheri is an assistant professor in marketing at Wilfrid Laurier University. Prior to joining Laurier in July 2017, Ebrahim worked at Laurentian University for seven years. His primary area of research interests include online consumer behaviour and social media marketing. His publications appeared in reputable journals such as Journal of Business Research, Journal of Services Marketing, Journal of Marketing Theory and Practice, and Journal of Retailing and Consumer Services. Shobeiri, S., Mazaheri, E., and Laroche, M (2018) “Creating the Right Customer Experience Online: The Role of Culture” Journal of Marketing Communications, 24(3), 270-290. Rezaei, S., Mazaheri, E., and Azadvar, R. (2017) “Determinants of Experienced Tourists’ Satisfaction and Actual Spending Behavior: A PLS Path Modelling Approach”, International Journal of Culture, Tourism, and Hospitality Research, 11(2), 157-181. Shobeiri, S., Mazaheri, E., and Laroche, M (2015) “How Would the E-retailer’s Website Personality Impacts Customers’ Reactions towards the Site?” Journal of Marketing Theory and Practice.23(4), 388-401. Shobeiri, S., Mazaheri, E., and Laroche, M (2015) “Shopping Online for Goods vs Services: Where Do Experiential Features Help More?”, International Journal of Consumer Studies, 39 (2), 172-179. Shobeiri, S., Mazaheri, E., and Laroche, M (2014)“Improving Customer Involvement in the e-Shopping Process through Experiential Marketing”, Service Industries Journal, 34(11), 885-900. Shobeiri, S., Mazaheri, E., and Laroche, M (2014) “How Customers Respond to the Assistive Intent of an E-retailer?”, International Journal of Retail & Distribution Management, 42(5), 369-389. Mazaheri, E., Richard, M.O., Laroche, M., and Ueltschy, L. (2014,) “The Influence of Culture, Emotions, Intangibility, and Atmospheric Cues on Online Behavior” Journal of Business Research, 67, 253-259. Shobeiri, S., Laroche, M., and Mazaheri, E. (2013) “Shaping E-retailer’s Website Personality: The importance of Experiential Marketing” Journal of Retailing and Consumer Services, 20(1), 102-110. Mazaheri, E., Richard, M.O. and Laroche, M. (2013) “The Role of Emotions in Online Customer Behavior: A Comparison of Search, Experience, and Credence Services,” Journal of Services Marketing, 26(7), 535-550. Mazaheri, E., Richard, M.O. and Laroche, M. (2011) “Online Consumer Behavior: A Comparison between Canadian and Chinese Website Visitors,” Journal of Business Research, 64, 958-965. Mazaheri, E., Basil, D., Yanamandram, V., and Daroczi, Z. (2011)“The impact of pre-existing attitude and conflict management style on perceptions of service recovery”, Journal of Retailing and Consumer Services, 18, 235-245. Mazaheri, E., Richard, M.O. and Laroche, M. (2010) “Investigating the Moderating Impact of Hedonism on Online Consumer Behavior.” Journal of Global Academy of Marketing Science, 20(2), 123-134. Tuesdays and Thursdays, 12 p.m. to 1:30 p.m. or by appointment.